Innovations are the foundation of society. Ideas, inventions, new ways of doing things–these are what ground civilization and move it forward. In Innovation, you are the leader of a civilization, guiding its progress from prehistory through the Information Age and managing its innovations to both benefit your society and destroy your enemy’s. And all of this within thirty to sixty minutes. Are you up for the challenge? Then check out Innovation below! 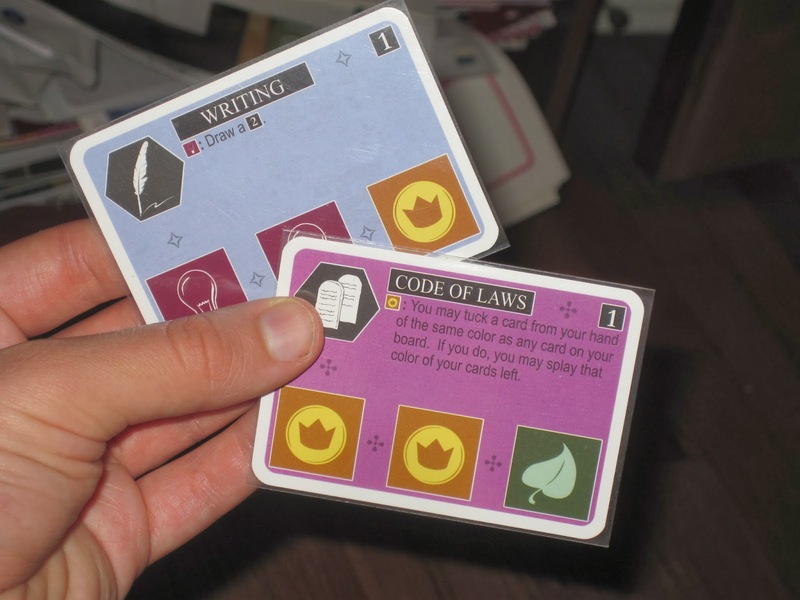 Innovation is a tableau- and civilization-building game for two to four players. Players control the ideas of a civilization from prehistory through the Information Age and seek to assert their civilization’s superiority through innovations. The first player to secure a set number of achievements is the winner. 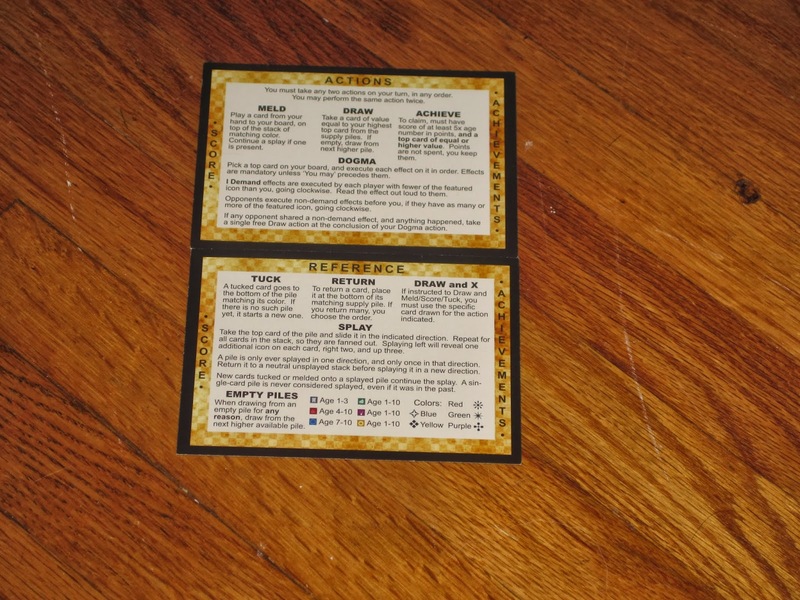 At the start of the game, each player receives a player aid/tableau guide. 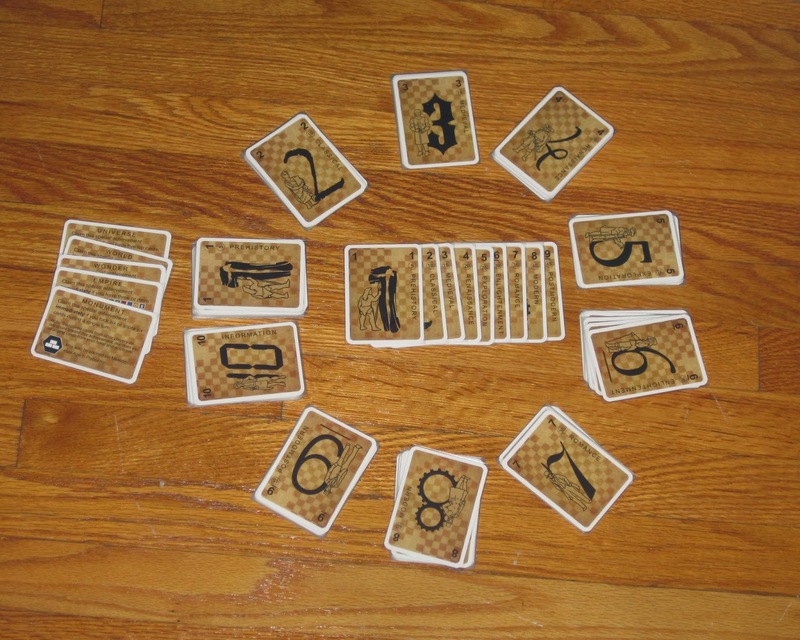 Players shuffle all ten piles of cards, representing the game’s ten historical ages. Then one card is randomly removed from each stack numbered 1-9. These are the game’s achievements, and they remain hidden for the entire game. The five special achievements are set to the side. 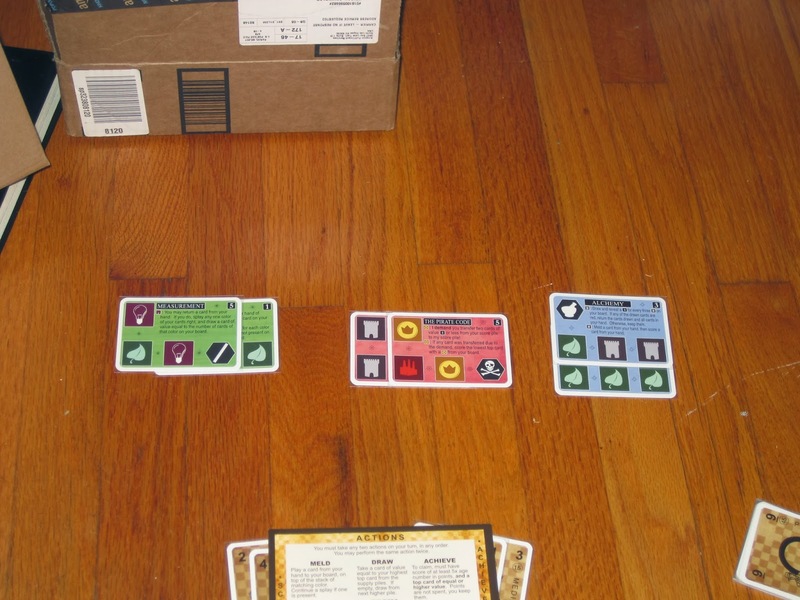 Each player receives two cards from Age 1 and secretly chooses one to be the starting card in his or her tableau. The player who chooses the first card alphabetically goes first. Innovation set up and ready to go. Players may play any card from hand to their tableau, but players may have only one stack of each color, so a card of the same color covers the older cards. Players may draw a card from the stack matching the highest-age card in their tableau, and whenever a player must draw a card from an age, if there are no cards of that age available, they take from the next age (this is key to the game). 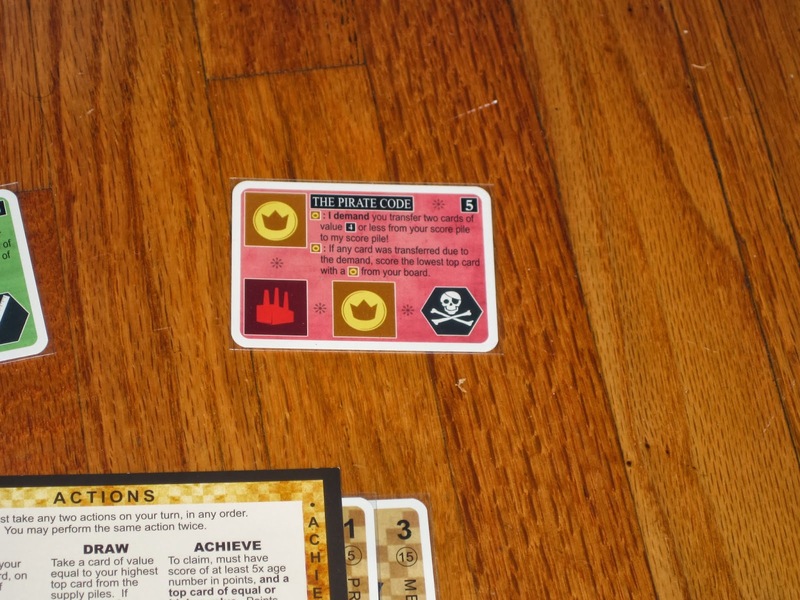 And players may claim an achievement card by 1) meeting the achievement’s score threshold (with their score pile) and 2) having a top card in their tableau that matches or exceeds the level of the achievement claimed. Achievements are the only “safe” cards in the game; everything else is up for grabs. The heart of the game is the dogma action. Each card has four icons (three of which mean something in gameplay) and a dogma ability, a unique action that the card’s owner can execute. Each dogma ability is keyed to one of six icon types and falls into one of two camps: regular dogma actions (which are generally good) and demand dogma actions (which attack other players). If a player executes a good dogma action, each other player with the same number or more of the dogma’s target icon must perform the action before the dogma player performs it. (The player using the dogma ability draws a card if any other players piggyback in this way.) Demand dogmas affect players who have fewer icons of the dogma’s targeted icon, and those players must perform the dogma effect. Dogma effects range from drawing and melding cards to getting cards into players’ score piles to removing cards from other players’ boards to changing the game’s win condition. 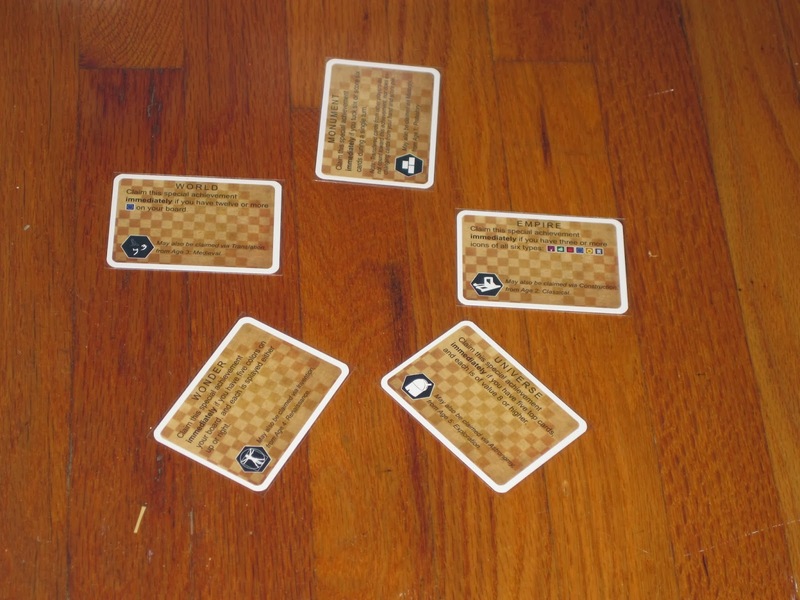 Three examples of splayed cards: splayed left, splayed right, and splayed up. Also, an Amazon box. Shame on me. I mentioned that each card has a number of icons on it, and only one card is on top of a color stack. However, cards can also be “splayed,” revealing icons in the stack underneath, which helps player actions become more powerful, opens options for sharing dogma actions, and protects from demand dogmas. Breaking Ground or Same ol’-same ol’? Innovation is a game that, looking at it from the outside, could go either way with me. In its favor is its small box size and small component footprint, its use of cards for multiple things (one of my favorite mechanics), and the quirky, off-beat premise (a civilization game through ideas). Working against it are its seeming randomness, its chaos, and its combativeness. Yet despite those elements in Innovation that are not my usual cup of tea, I find the game a blast from start to finish, one of my favorites. included a reference for special achievements. 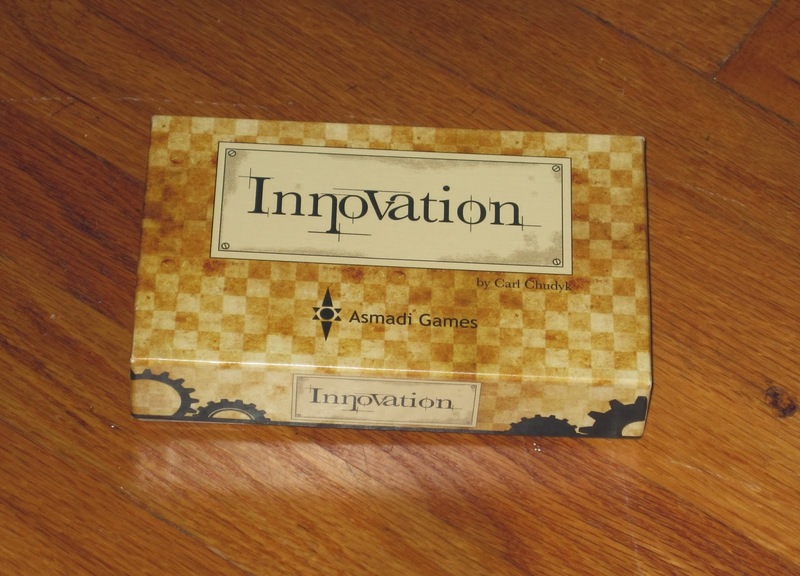 One thing I really like about Innovation is that the game system is simple: each turn involves two actions, and these actions are straightforward: draw a card, play a card, activate a card, or claim a victory card. Easy peasy. Yet while the basic structure is simple, the game diverges with the cards. One box of Innovation contains 105 age cards, each of them unique, and each with its own dogma effect. That’s a lot of variation in the box. But even with this variation, the game doesn’t seem overwhelming, at least to start, because each player begins with two cards, both from the first age. The cards (and gameplay) open in complexity as the game progresses, so it’s easy to wade into the game. 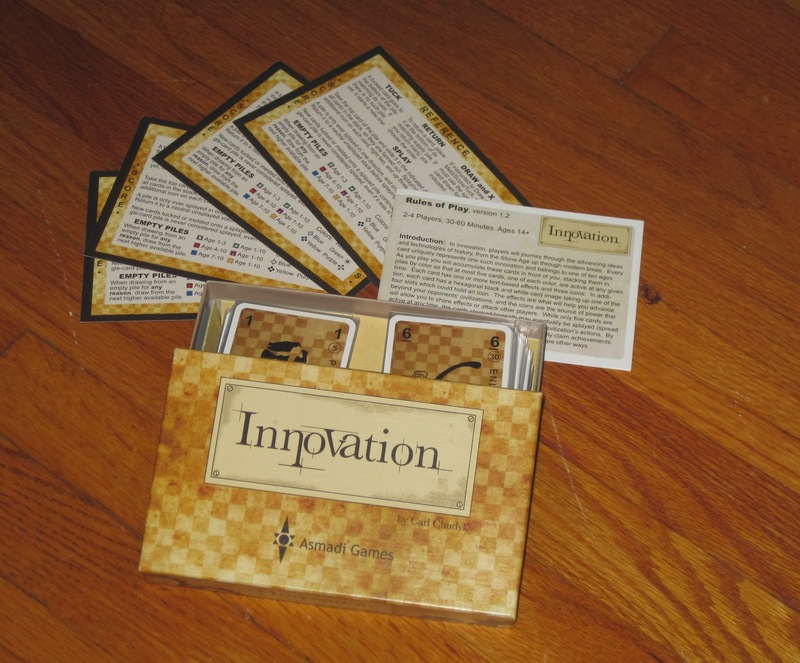 Despite Innovation’s simplicity, there is a lot of game here to wrap your mind around. The reason is that two actions per turn is never enough to accomplish what you want to accomplish, and you don’t know if you’ll get another crack at whatever it is you want to do. Innovation, like the realm of ideas, constantly changes. One turn you might be attacking another player through your cards’ dogma effects; the next turn, your powerful cards might be in their score pile. So players have to find clever means to accomplish their ends, sometimes taking gambles on their dogmas. The game revolves around the six icon types, which abstractly represent a society’s strengths and values. Having more icons of a type than anyone else allows you to either browbeat them into submission (through demands) or piggyback on their non-demand dogmas. The problem is that there are six icon types, and it’s very rare indeed for a single player to be the top dog in all six. This is where the game gets tricky: you have to balance benefiting from more icons in some areas while conceding in others. And conceding can be devastating. It’s awesome to demand things of other players; it’s dispiriting to be the one demanded of. The Pirate Code. A feared card on the high seas…and in Innovation. And it’s this way with most, if not all, of the cards in the game. There are so many power combos and so many power cards that it’s really unlikely for one player to have a monopoly on them. (Though one player can use them to better effect, which is what you’d expect in a strategy game.) And even a monopoly doesn’t usually last long, since the more powerful demands either 1) dismantle the cards used in the combo or 2) feed good cards to the player being demanded from. Of course, since players with the same or more icons of a type must follow your non-demand dogmas, it’s also quite satisfying if you can find a way to manipulate the good dogmas to either mess with your opponents or benefit you more. The constant change in game state can make Innovation seem random or chaotic, but it’s really not as bad as it looks. Yes, it’s difficult to plan too far in advance, or even your next turn, but as long as players understand this, they can usually take the game in stride. Players can also work to set up their boards in such a way as to maximize future opportunities. One of the ways players can do this is through splaying their cards, which involves cascading piles of cards so that more icons are revealed. This allows players to benefit from buried technologies played early in the game. Turn 1: which to meld? Innovation can be open to swings of luck. While achievements, once earned, can never be lost, the cards in players’ score piles are fair game and are open to the slings and arrows of outrageous dogmas. Similarly, while the game is won through achievements, it is possible for players to make major comebacks. First, there are the special achievements, which reward players for outlandish things that, if they can pull off in their tableau, move them one step closer to victory. Then there are the special end-game conditions, found in the late ages of the game. Cards like A.I., Bioengineering, Self Service, and Collaboration all have instant win conditions that may hand the game to a player who is not in the lead. And finally, the alternate win condition if a card higher than 10 is to be drawn is by score pile, which, again, is not necessarily related to the player with the most achievements. The swings of luck in win conditions will be bothersome for some people, but they are not to me. Each win condition takes strategy. If a player is in the lead for achievements, he or she will want to end the game by winning more achievements, meaning continuing what’s been working and getting more cards in the score pile. If a player is seemingly out of the running, he or she will want to run down the clock by zipping through the ages–either hoping for an alternate-win card in Ages 8-10 or hoping to have a packed score pile once the timer runs out. I love that there are more ways to win than the conventional one because it keeps players on their toes. There’s no resting on your laurels in Innovation. And no matter how dire a situation looks, there’s always the possibility of a comeback. I love this aspect of the game because it keeps players engaged the whole way through. A legitimate point against Innovation, at least in my experience, is its tendency to produce analysis paralysis in players. I mentioned that Innovation is simple to learn, and that’s true. But because of the complexity of the cards, the constantly changing game state, and the often clever manipulation of actions to accomplish what you want to accomplish, it can be hard to plan in advance. It’s also hard if you’re unfamiliar with the cards to know which dogmas each player has at their disposal. (My advice on this point: play obliviously, at least until you pick these up naturally. It’s thematic this way, and it also speeds the game up considerably.) This game is the “time traveler’s” worst nightmare–I recommend a policy of not letting players take back their moves, or the game might never end. Given Innovation’s chaotic, often combative gameplay, I think it’s best when the game is played fast and loose–completed in 30 minutes to an hour. It bogs down if every option is considered, weighed, executed, taken back, and executed again on every turn. So you may want to avoid playing the game with the AP prone. Also, I think the game’s sweet spot is three players. With two players it’s also fun, but three is more exciting to me, even if the bookkeeping of monitoring icons is a little tougher. I don’t recommend the game with four players (though the rules provide for a team variant that might make the four-player experience better). What comes in the box. In the words of Han Solo, “She may not look like much, but she’s got it where it counts.” A LOT of game comes in this small box. The components of Innovation are serviceable, but not spectacular. I like the clear layout in the Asmadi version (the one I own), and it’s very easy to tell the six icons apart, though the abstract art and layout makes the game feel even more abstract than it is. (The recent Iello version helps this, but I don’t find the layout quite as clear. Different strokes for…different people.) The player aids are very clear, though I do wish they included a list of the special achievements on them, as it’s difficult for me to remember what each is, and it’s often hard to read them from across the table. These are minor complaints, especially since what matters are icons and dogma text, and both of these are crystal clear. I recognize that Innovation won’t be for everyone, and maybe shouldn’t even be for me. But I love it. Despite the abstract nature of the civilization building, the theme really comes through for me on individual cards. The game, like most of Carl Chudyk’s designs, is brain bending, but in a good way. I like attacking others through saying “I demand!” every time, and I love it when a combo comes together–even if it’s another player’s. Innovation is almost endlessly replayable, even without its expansions, because each card is unique, there are so many of them, and the order they come out in (or don’t, in the case of achievements) affects the gameplay to a great degree. Innovation, despite having a simple rules system, is sometimes tough to understand, but it’s always rewarding. This is a game that I love and am almost always itching to play. I also find it odd how much I love this game despite having some elements that would normally be a turn off for me. I think it’s mostly that everything fits very naturally together so it isn’t just conflict for conflict’s sake or chaos with no sense or control. I’ve found that the conflict and extremely tactical nature of Innovation can still be a big barrier for some but if there’s a game that can challenge people’s perception about those things I think this is it. I also prefer the Asmadi design, it is so clean and the game is already very abstracted so I don’t mind the lack of pretty pictures for immersion. I was excited when the Iello version was announced but the cards are just too busy for my taste and I disliked some of the terminology it used. This is an information heavy game so I’ll take the more functional design. I agree about the conflict. As we see in our current political climate, ideas can be combative. I imagine Innovation as various civilizations striving to so embody their ideas that they use them as the means to attack others. All that to say, it makes sense. And you’re right: definitely not a game for everyone. Yes, more functional design. The cards are clear. I was struck again looking at the pictures in this review just how clean the design is. Easy to follow, which makes a somewhat disorienting game much easier to navigate. or maybe the edition I have is the French version of an ulterior version?